Over at BlogF1, Oliver White has asked the question I Love/Hate Monaco Because... I was going to answer in a comment but then realized it would be too long a story and really needed a post to itself. So here's my answer, Ollie. I love the Monaco GP; it is one of the two highlights of the year as far as I am concerned, the other being the race at Spa Francorchamps in Belgium. The attraction of Spa is obvious but Monaco has memories for me that guarantee it a place of honor. It was the first GP I saw, admittedly on a black and white newsreel, at least a year out of date and absurdly edited to a few seconds of grainy film. But it was enough to turn me into a F1 fan from that moment. It was film of perhaps the greatest Monaco GP ever, you see - the 1961 race in which Stirling Moss, in a little, boxlike Lotus, took on the mighty Ferraris and humbled them. That year Ferrari were way ahead of the competition, having a car, the famous sharknose 156, already designed for the new 1.5 liter formula before it was revealed. The British teams were caught out by the sudden change and their cars were hastily cobbled together around an adapted Coventry Climax firepump engine. In the early races of that year, Ferrari put on demonstrations of power as their cars lined up for the victor's spoils. But Monaco was different - here the tight corners and short straights meant that the power advantage of the Italian cars counted for less and there was just a chance that the smaller teams could get amongst them. In the event, however, it was only the brilliance of Moss that could challenge the Ferrari supremacy. Early in the race, he took the lead and stayed there, just out of reach of Ferrari drivers Phil Hill and Richie Ginther. It was a classic David and Goliath story of the type that makes GPs live forever; I was hooked. Journeyer has collected some excellent videos of past Monaco races for his guest article on F1 Fanatic and the 1961 race features; it is well worth a look, although, like the newsreel I saw so long ago, it is very brief. But I would point to the number of great races that have taken place in the Principality and suggest that Monaco is unjustly criticized for producing boring races. It is just not true. Ask any driver from any period and he will tell you that it is impossible to overtake at Monaco - and, theoretically, that is so. But the facts conflict with theory, the GP often producing more leader changes than most other races on the calendar. Often, this is thanks to retirements through contact with barriers or other disasters but there are times when the great drivers find a way through anyway. I recall one Monaco GP, probably about 1981 or thereabouts, when Nelson Piquet in a Brabham BT49 came up behind the leader (can't remember who it was) and sat behind him for lap after lap, looking for the passing point that was not supposed to exist. Then Nelson began to drop back, apparently having given up the hopeless quest. There followed a lesson in the creation of passing manouvers at a spot previously thought impossible. Coming up to the entrance to the tunnel, Nelson still had that gap between himself and the leader - emerging from it he was right on the tail of the car ahead and invisible to its driver. As they approached the chicane, Nelson dodged left and was level under braking; unable to turn in without hitting the Brabham, the leader was forced to give way and Piquet was through and gone. That is the glory of Monaco - it forces the great drivers to do the impossible. Add to that the fact that it gives drivers of less competitive machinery a chance to show their skills and we have all the ingredients of a classic circuit. When we factor in the frequently-mentioned setting, the boats in the harbor, the steep inclines, the elegant Monegasque architecture towering above the narrow streets, there can be no doubt that this is a race that deserves its permanent place in the calendar. Even those Monaco GPs that fail to produce heroic moments are worth watching for the atmosphere and the visual splendor. There is nothing quite like it anywhere else in motor sport. May it last forever. Possibly the best answer yet. Thanks for answering my question in a more substantial and insightful way. 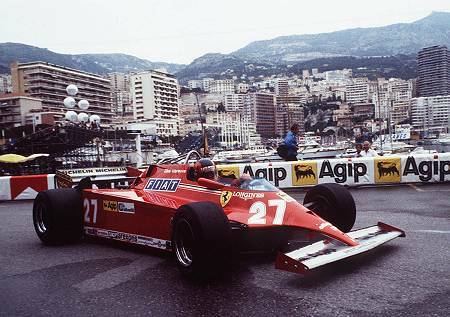 1981 was the year Gilles won in the car that didn't like corners. Piquet never won Monaco but the incident you mention could be part of the race no-one wanted to win in 1982. Every time someone gained the lead they found a way of losing it. In the end Piquet's team mate Patrese won after having previously spun out of the lead(I think). There were so many incidents I can't remember half of them. I am fairly certain Patrese was in the lead and spun thinking he had blown it only to get it back when the new leader ran out of fuel. Crazy race. You are probably correct about the year of the race, Steven - I had discounted 1982 as the season Piquet spent getting the BMW turbo engine right; But, thinking about it, I realise that Brabham would not have used the BT50 at Monaco and it makes sense that Nelson would have been back in the old BT49 for that one race. I was pretty sure that Piquet did not go on to win the race, so accustomed am I to his luck deserting him at crucial moments. It is just that brilliant overtaking move that I remember as clear as day - definitely the best example of "putting one over" another driver that I've ever seen. According to Wikipedia(*???) Piquet used the BT49 at Monaco in 1980, BT49C in 1981 and BT50 with the turbo in 1982. He finished 3rd in the first of those races and retired from the other 2. In1982 he used the turbo in the first race at Kyalami then switched to a BT49D for Brazil, US West and that race at San Marino before switching back to the turbo BT50 for the black weekend in Zolder and kept it for Monaco. Then it would be back to my first guess, 1981, as the date of the race, I think, Steven. My memory may be at fault in that the pass may not have been for the lead - I used to watch Piquet's progress through every race in those days. It surprises me that they used the BT50 at Monaco in 1982, however. There was no way it was going to be competitive there, even it managed to last the race. I note the question marks after the mention of the Wikipedia; my feelings on it are that it may be dubious at times but it supplies answers where other sources don't. On F1 it tends to be pretty accurate and and errors will be fixed in time, I'm sure. Ah, great and emotive post. Why can't Monaco, Long Beach, and Macau all be in the same series? F1 don't need to pay someone to tell others how great it is or can be, yet Indy has to run all kinds of "we're still important, honest!" ads. By comparison, F1 is quite healthy, now, isn't it? Ah, Monaco, the greatest of all races and the greatest of all marques, Ferrari. Speed TV is replaying the race at 2pm Pacific time, so will be enjoying a large salade Niçoise, some country pâté and a nice 2001 Barolo (the last year Schumi won here for the scuderia) for lunch in front of the wide screen. I hope Kimi does the prancing horse proud - he knows his way round having won in '05 from pole - and I'll be saving a glass to toast him to the sound the Italian anthem. Forza Ferrari! Other than Melbourne, Monaco is the only other GP I have been to, so naturally it is one of my favourites. I fear I have set the bar too high ! I know I haven't been watching F1 as long as you guys have - but I don't recall a dull race at Monaco in the time I have been watching. They just seem exciting, somehow. The staggering thing about Moss's performance in '61 is that over 100 laps of Monaco his race lap average was within a staggering half a second of his pole position time. Only by driving at the absolute limit of that little Lotus could he hold the might of the Ferrari's at bay. It's days like that that leave many seasoned observers (such as Alan Henry and Nigel Roebuck for example) of the opinion that Moss - despite his 'failure' to win a world championship - is the greatest racing driver of all time. Thank you, Journeyer - you are very kind, as well as exhibiting excellent taste in YouTube videos! Good Day. I have often wished I had time to cultivate modesty... But I am too busy thinking about myself. I am from Armenia and now study English, tell me right I wrote the following sentence: "Analysis comments an insurance plan can assure that everything you." With love :(, home insurance lead.